It is no secret that the U.S. population is steadily growing older. More than 77 million American children were born between 1946 and 1964, and that generation is now beginning to reach its senior years. As the U.S. population grows older, it’s important to monitor elders’ health and well-being. There’s a federal agency — The Federal Interagency Forum on Aging Related Statistics — set up to do just that. In 2014, 46 million people age 65 and over lived in the United States, accounting for 15 percent of the total population. In the next 15 years, the size of this age group is expected to reach more than 74 million. The number of older people living in poverty has declined gradually over than last 50 years. Currently, about 10 percent of older Americans live in poverty, down from nearly 29 percent in 1966. This age group receives two-thirds of its income from retirement benefits, including Social Security. Older Americans spend a greater percentage of their income on health care than ever before. People ages 75 and over spend 16 percent of their income on health care — more than they spend on transportation or food. For older Americans, death rates declined for heart disease, cancer, chronic lower respiratory disease, stroke, diabetes, and influenza and pneumonia. At the same time, death rates for Alzheimer’s disease and unintentional injuries increased. Only about 12 percent of people age 65 participate in physical activities that meet federal guidelines. Caring for older adults is a major activity for millions of Americans. In 2011, the most recent year data are available, an estimated 18 million informal caregivers provided 1.3 billion hours of care on a monthly basis. The majority (11.1 million) of these caregivers were women, and about half of them are ages 45-64. In addition, almost all caregivers were children of the care recipients. Types of care provided differ by caregiver gender. For example, men were more likely to provide assistance with mobility, whereas women were more likely to assist with self-care and medical care. Most informal caregivers reported positive impacts of caregiving; however, almost half said they have things they cannot handle or do not have enough time for themselves. As the U.S. population ages, older adults are going to require more care than ever before. That’s because they are living longer with chronic conditions such as heart disease, cancer and diabetes. And they are more likely to suffer from cognitive problem, such as Alzheimer’s disease. 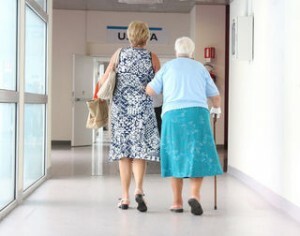 This means that millions of middle-aged adults are spending billions of hours caring for their aging relatives. This trend comes with a multitude of consequences. Economically, middle-aged Americans are juggling work while caring for aging parents. Socially and emotionally, caregivers must find the time and energy to take care of their older relatives, often at the expense of their own goals and pastimes, or those of their children. Research clearly shows that when caregivers are supported, the quality of their lives improves, as does the well-being of the people receiving the care. A systematic review published in 2014 found the most effective forms of support are providing specific information about how to care for older adults and psychological supports for the caregivers themselves. The take-home message: Informal caregivers are going to require increasingly more support in the decades to come. The data demonstrate that this type of support is effective at helping both caregivers and the recipients of their care.